Calm Down, The Paracas Skulls Are Not From Alien Beings! April 10, 2015 – PERU – Yesterday, I wrote an article about a set of genetic tests done on a sample from one of the famous elongated Paracas skulls, which are 3,000 years old and were found in southern Peru. The basic news was this: some genetic tests had found DNA in the skulls that was reportedly previously “unknown in any human, primate, or animal known so far.” The implication, helped by the distinctly B-movie “alien” appearance of the skulls, was that the skulls must contain extraterrestrial DNA. 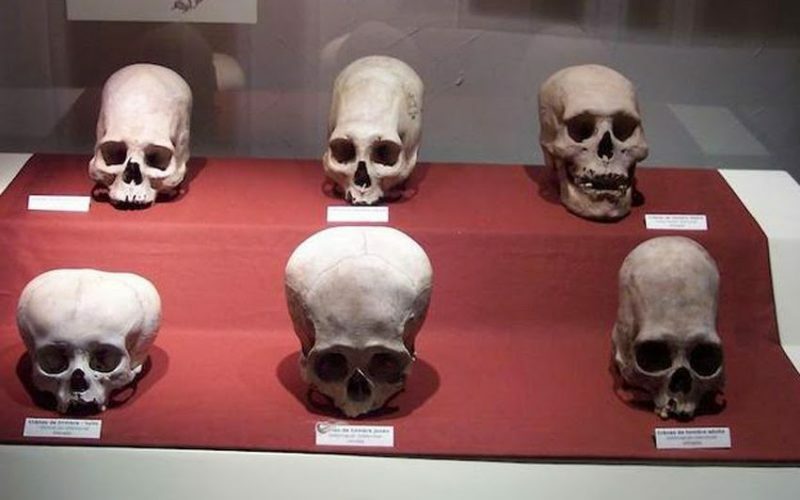 Scientists and archaeologists generally believe that the skulls’ strange appearance is the result of intentional deformation practiced by the Paracas culture. I saw this story floating around in the paranormal blogosphere for a few days before I decided to report on it. I ignored it, frankly, until it was picked up by Yahoo! and the International Business Times, as well as a few smaller news sources around the world. So I wrote a short article, mostly because it was a silly story that was fun to write about after a morning of writing about human trafficking and illegal gold mining. But I find this story really, really irritating. Don’t get me wrong, it’s not the alien part of this story that bothers me. I believe in the possibility of aliens. More than anything, it bothers me that established news sites apparently failed to do even cursory research on the background of the story before publishing it. Let’s start with a quick talk about aliens. In an infinite universe, it seems foolhardy— even arrogant— to completely dismiss the idea of extraterrestrial life. There are so many galaxies, so many planets, so many suns; across the neverending expanse of space, one suspects that there must be another group of intelligent beings somewhere. But suspect is the key word there. We have no credible evidence for the existence of alien civilizations. As Carl Sagan said, “Extraordinary claims require extraordinary evidence.” And claiming that the Paracas skulls are possibly alien is certainly extraordinary. So let’s look at the evidence— does it measure up? Well, the short answer is no. First, consider the source: the preliminary results of genetic testing were announced by Brien Foerster, who is the assistant director of the Paracas History Museum. That’s a pretty impressive title, and I’ll admit that it threw me. That title implies formal archaeological, curatorial, or history credentials, maybe a body of peer-reviewed research projects. That title implies that he has serious academic credibility, and that we should listen to his announcements about his areas of expertise. None of this is true. Some pretty basic Google research turns up some facts about Foerster that cast his announcement in an entirely different light. First, his academic credentials: by cobbling information together from the webpage of his company Hidden Inca Tours and his official Facebook page, it appears that he has a Bachelor of Science from the University of Victoria, in British Columbia, Canada. Foerster doesn’t offer any further information about his educational background, including his exact field of undergraduate study. I was unable to find any evidence of an advanced degree. So what about his role as assistant director at the Paracas History Museum? How did a paranormal tour operator get that job? Well, first, the Paracas History Museum is a private museum. It’s owned by one Juan Navarro, who is also its director. Navarro is also listed on the Hidden Inca Tours webpage as a member of “Our Team of Experts.” I was unable to find any mention of academic credentials earned by Navarro, either. My preoccupation with academic credentials is not meant to downplay the immense wisdom and experience possessed by many people who do not have undergraduate or post-grad degrees. Being smart does not require a college degree. Heck, it doesn’t require any kind of education at all; it’s an innate quality. However, scientific expertise is not an innate quality. It is something that is gained through years of study and research, both of which are usually completed in an institution that awards successful students degrees upon graduation. To be fair, I don’t have any special academic credentials that make me an expert in archaeology or genetics. But I’m not arguing that the data is flawed— we haven’t seen the full data, and I’m not qualified to speak on that— but I am arguing that a number of features of the announcement should warn us not to take Foerster’s announcement at face value. That brings us to the strange nature of the announcement. Foerster announced the results personally, via internet, rather than through a scientifically reputable source. There’s also the matter of the testing itself. According to Foerster, the geneticist who discovered the allegedly never-before-seen DNA, wants to remain anonymous. If that’s not a red flag for the credibility of your research, I don’t know what is. The final nail in this story’s coffin, for me, was the revelation that Foerster had appeared on the popular History Channel program “Ancient Aliens” multiple times. In yesterday’s article, I said that the scientific and archaeological communities generally regard “Ancient Aliens” as inaccurate. “Inaccurate.” That was an understatement. That’s a noble goal. But if you really want to find out who the people of the Paracas culture were, speak to some archaeologists. Make your research transparent and available to the public. Have your data reviewed for journals with stringent requirements and high standards. Don’t use an historical oddity as a cheap hook for your tour company, or to sell books. If your goal is to help enrich humanity’s knowledge of our ancient past, then share your information with us instead of releasing only selected snippets of admittedly preliminary results. Otherwise, we have no reason to believe you. – Rachel Chase / Peru This Week.